It was my day off and I decided to take Faith out to breakfast and to do a little bit of Daddy-Daughter time. As we were walking in the nice breezy morning of 25 degrees Celsius, her hand was in my palm. I looked down at our hands and a few questions popped insider my head. When will be the day that she would stop holding my hand? Who would be the next guy to hold her hand? It was a quiet walk and we were both contented, just walking and listening to the rustle of the leaves, dancing in the fresh morning breeze, complimented by the regular rhythmic plops emitting from her pair of little wooden clogs. All the best for the marathon fund-raising! It's a great cause. And what a little moving entry; it's a peek into the tenderness of a father's heart behind his usually stoic and strong exterior. Anyway, thanks for the well wish for the coming RFF Marathon. Adrian has already started training for it while I won't need to kick start our PR efforts until much nearer to the actual marathon date. But seriously, that's so sweet. I have long since stopped holding my dad's hand. Or rather, I seldom hold his hands anymore. hais. Ollie: Lucky never show my messy hair at the same time or else you confirm nose bleed. Question: You said you seldom hold your dad's hand. But when was the last time? Ollie: This year? Well, that is very encouraging to hear for I thought it would be all over by the time they reach their teens. Anna: Then when was your last time? haha.. I think I know why you say it's encouraging. 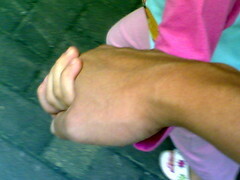 'cause it means that your daughter has a very high possibility of holding your hands even at the age of 20. Right? hahaha..
Ollie: Don't know lah... I always under the impression that by the time they reach their teens, then no more liao. But then you already 20+ liao still got hold your daddy's hand and so I say encouraging lor since there is still hope there. Anna: No prawn, fish also goot er... I mean no hand arm also goot. Bet my dad was thinking the same thing years before. Lex: Don't cry lah... go and hold your dad's hand lor. Akk: Not that type of holding hands lah! Arrgghh! !